Did you see this great deal on router bits at Eagle America? When it comes to router bits, there are some that are nice to have and others you simply must have! 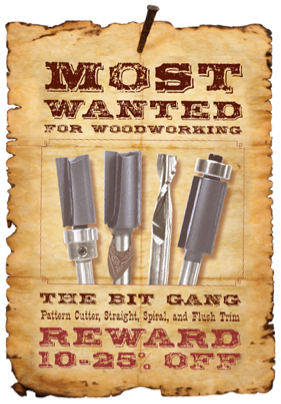 These include the notorious Bit Gang of Straights, Spirals, Pattern Cutters and Flush Trims. So from now until March 31, 2011 you can save BIG while buying the bits you’ll use on almost every project. Just a quick reminder, we’ll be drawing the names of this month’s schwag winners on Friday and because so many of you have been submitting your entries the past couple of days, I’ve decided to extend the entry time until 9PM ET on Friday January 28, 2011. Head over to the Schwag Page today to fill out the entry form. I have bought from eagle before. I need a 2 inch wide flat bottom bit, for making straight flat surfaces.